The following post is a guest post by Sarah Landrum. After graduating from Penn State with degrees in Marketing and Public Relations, Sarah Landrum moved to Harrisburg to become a digital marketer. She is also a freelance writer and the founder of Punched Clocks, a career development blog that helps readers find happiness and success in life and at work. Follow Sarah on Twitter @SarahLandrum for more great advice on all things career and marketing. The power of Pinterest is strong: A survey of Pinterest users indicates that around 70% use the site to find inspiration for items to purchase. Pinterest is growing quickly. Although still lagging behind Facebook, Pinterest now secures about 42% of online adult women as users and around 13% of men who are online. That’s a large market – and a lot of purchasing power – you stand to lose by not promoting your Pinterest. So, how do you go about Pinterest Promotion to get the most benefit? Here are a few tips to get you there from start to finish. Once your business account is set up, images are added and a professional image is established, there are several ways you can use Pinterest to promote your business. Tell your current social media connections that you’re now on Pinterest. Be sure to share your profile link. People who only occasionally use Twitter may visit Pinterest every day, so letting them know you’ve expanded to the platform will immediately increase your reach to those followers. Announce your Pinterest board in your newsletter and on your website as well. Your next step is to add pins to your board. Simply click on your profile and the plus sign that says “Create Board.” Once the board is created, you can click on the board and then choose “Create Pin” to add a URL to your website. Don’t forget to re-pin from other boards, and to share advice related to your business as well. Feature rich graphics. Remember that Pinterest is a visual medium. Contain appealing content. Something that appeals to Pinterest’s audience, such as home décor, cooking and crafts will serve you well. Once you’ve added some pins, choose a couple to promote. You’ll need to apply via the Pin Promotions page. Pick a pin that you think is one of your best. Think outside the box but remain true to your brand. Decide who you want to target for that pin. What are the demographics for your target audience? You can also target specific keywords. Pay Pinterest for the visits to your site. You pay for click-throughs and not just views. You can set a budget so you don’t get socked with a huge bill. Finally, check out the campaign stats to figure out what is working, what isn’t and what you’d like to change. Encourage others to share your pins to increase your reach with no additional effort. Add a plugin that allows people to share your content to social media. You can then include your pin widget and hopefully gain a share and a new follower. Capture first-time visitors and convert them to followers. Allow current fans to stay up-to-date on what you’re doing. Add a sense of legitimacy and currency to your site by showing you understand social media. Pay attention to popular hashtags. Hop on them and add your own pins, but make sure they add value. Use trending topics. Is everyone pinning Fourth of July recipes? Write one and tie it into your brand somehow. Pay attention to your wording and utilize SEO. Add a valuable pin to an open board. Create a separate board for your blog posts. Your friends and family may jump on your profile to see pictures of the prom, but your blog readers can also just go directly to your blog board and skip the pictures of people they don’t know. You also have the option to make boards secret. 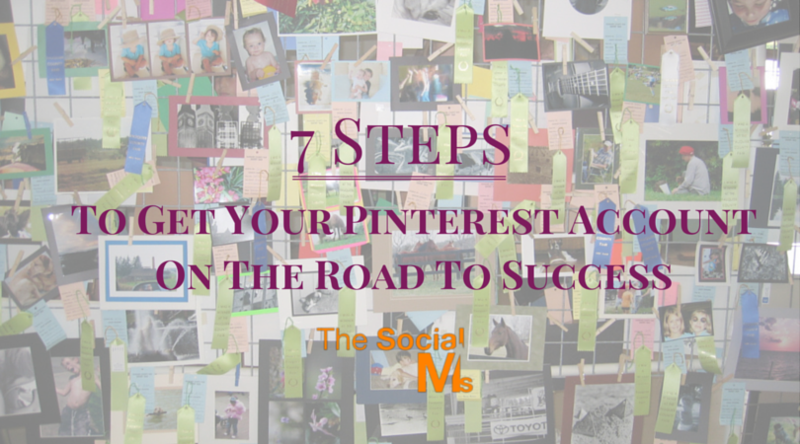 Getting started with Pinterest is an easy process. The social media platform has plenty of tips for businesses available through your drop down account menu located at the top right of your homepage. With a little perseverance, you’ll gain followers and learn how to share pins in no time.